Hirshfield’s is excited to announce we’re adding a new product called Cottage Paint, to our line of decorative paint finishes. Cottage Paint is a clay-based paint that dries to a matte finish. If you’re looking to update an old piece of furniture, this is the product for you. Cottage Paint is a clay-based paint that dries to a silky matte finish and remains porous and easy to sand or wet distress when dry. We didn’t invent this paint, it’s been around since the frescos in the Sistine Chapel! We did, however bring it up to modern environmental standards by removing almost all of the VOCs in both the bases and the pigments. 1. Cottage Paint dries in about 15 minutes to one hour. I’m not joking. BUT for a rule of thumb – never do more than THREE applications of anything to a piece per day. 3. It requires NO sanding, priming or stripping. NO prep work – just a CLEAN surface. We recommend using TSP to get it good and clean. 4. It can be distressed as soon as it is dry using a damp cloth or fine sand paper. 5. Cottage Paint does not roll or peel like latex when sanded, and appears as if the paint has truly worn off over time. People get really excited about the “no prep” aspect – but use your judgement. I was working on a chair with a high-gloss factory finish, and I took five minutes to scuff it with sandpaper to assure maximum adhesion. Use TSP to clean the piece making certain it is clean, clean, clean. Cottage Paint offers a clear wax coat in three different sheens for a protective finish. For a tougher finish a varnish top coat can be applied. Also, included in the Cottage Paint products are colored waxes (including a liming paste) which will give your furniture that aged antique look. The standard Cottage Paint line has 50+ colors in 8oz. containers and any Hirshfield’s paint color can be mixed in quarts. In addition to the extensive palette of pastels and brights, imagine all the color possibilities you have just by adding white to a color. The majority of Hirshfield’s stores carry the Cottage Paint products but call your local store just to make certain before you make a special trip. Would you like your walls to be as stunning as the walls in this photo? You will need paint from Hirshfield’s, a stencil, and a steady hand. If you are trying your hand at stenciling, and want a tone on tone finish, test the different sheens on sample boards. Try a flat or matte finish with a semi-gloss as a topcoat; or an eggshell base and a high gloss top coat. Another option is using the Benjamin Moore Metallic Glaze as a topcoat. 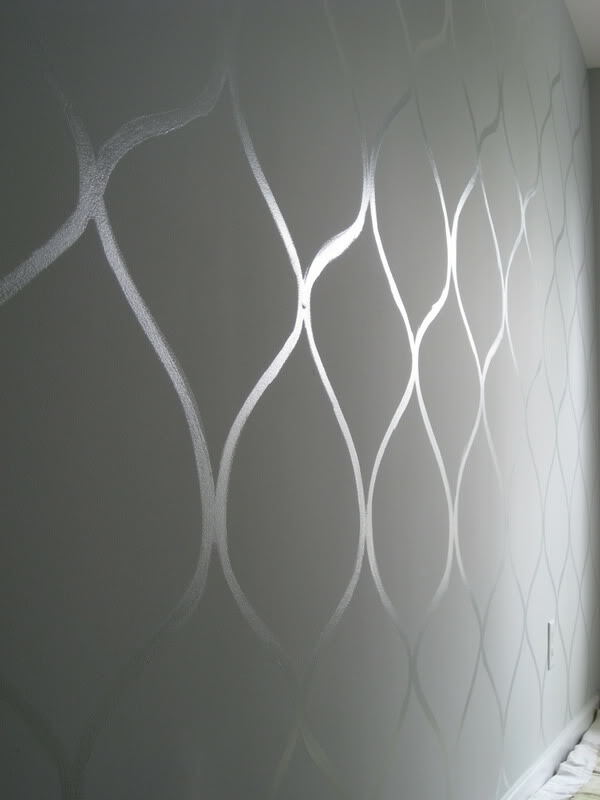 Hang the sample boards on the wall, in the space you are planning to stencil, with the lighting you are using. Is a 60 watt bulb reflecting off a high gloss topcoat a good look? Personal preference. You decide. 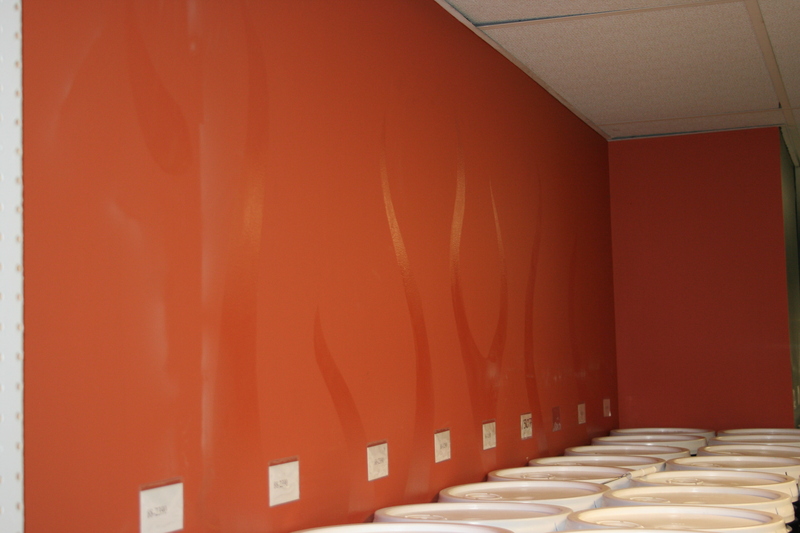 Hirshfield’s downtown contractor service center painted flames on one of their walls using a matte finish as the base and a satin topcoat. The flames are so subtle that unless you catch the light at just the right angle, you don’t know the flames exist. The guys at the CSC told me you can achieve the same tone on tone look, by using a clear, acrylic topcoat instead of paint. 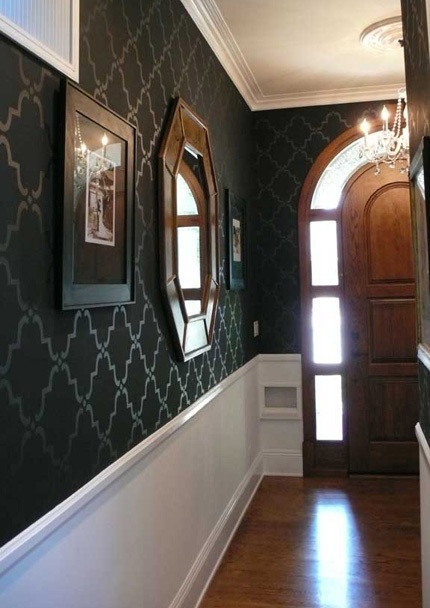 Are you familiar with the Imperial Trellis wallpaper from Schumacher? One of my favorites. Hello, Gorgeous made her own Imperial Trellis stencil… you’ll have to read her posting for the entire scoop, stencil making and all. Keep in mind, she did an accent wall, not the entire room. Sheen can highlight imperfections or hide imperfections. Get it right before you buy your Hirshfield’s paint and sundries. Have your people talk to my people, because my people are the experts. Do you have time for one more great looking wall? Hope so. Compliments of the talented kristin f. davis designs. The Plaster Center has a few stencils on hand and catalogs for you to look through. They can also give you names of applicators to do the job for you. Royal Design Studio has stencils and tons of how-to information. Don’t forget her blog DesignAmour. Shop local…For every $1.00 you spend in a local business, 68¢ stays in your community. Spend that $1.00 in a national chain and 43¢ stays in your community. Support your local businesses. 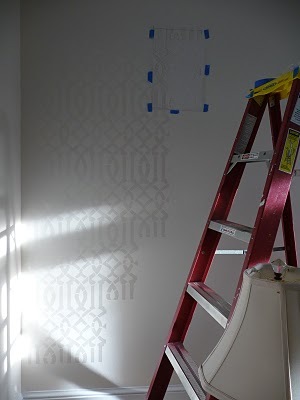 Break up any painted wall & give it more glam with a tone on tone stencil. If you are not familiar with the term “modello,” it is a one time use masking pattern. Just like a stencil, but comes with adhesive already applied to the back. If you look closely at the last image you can see the creases in the paper as he applies the modello to the ceiling. Make certain to click on the link and see the finished ceiling. The blue you see in the photo is the adhesive, not the painted ceiling. For more information please contact the Plaster Center. The Plaster Center has stencils on hand for purchase, stencil catalogs to look through, and knowledge to share. They can recommend local artisans who specialize in the field of stenciling and hand painting if you want the help of a local expert. Thank you to Melanie Royal for allowing us to use her photos. Designamour, is her blog, Royal Design Studio is her stencil line, and Modello Designs, her modellos. Research on-line and shop local…68¢ out of your dollar stays in the community when you support locally owned businesses versus 43¢ at non-local businesses. Minnesotans hang on to your pennies! I’ve never been a fan of rag rolling — even in it’s heyday when it was first introduced. So when my neighbor invited me in to show off her new faux walls in her family room, I prepared a few niceties in my head to match her enthusiasm. To my big surprise, I loved what I saw. The walls were painted a rich reddish brown; it looked like they had been covered in textured leather (seriously, I touched it expecting a polished feel), and it gave the room a warm, cozy and inviting look. I instantly saw why my neighbor was so euphoric. “I feel like I just updated the entire room,” she cooed, and I had to agree. Of course, it didn’t take much time for me to hop on Hirshfield’s website to learn that the rag rolling of the late ’80s that I remembered has been replaced with updated techniques, colors and textures for seriously beautiful results. I’ve got to go; I’m on my way to remind my neighbor that to copy someone is the highest form of flattery! A beautiful faux finish can really transform a room.